There’s a reason the saying, “Time is money” has stood the test of time. It’s because the saying is true, more than you know. When salaried workers work extra hours, they’re getting a pay reduction. And if you change jobs and work more hours, a pay increase might not make up for the extra time. There are times when you need to work extra hours, but if it becomes a habit, make sure you realize the effect on your pay. 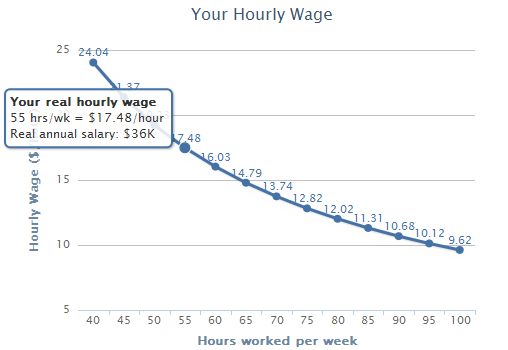 I was curious to see the numbers, so I wrote an hourly wage calculator and was stunned by the results. If you make $50K and work 55 hours a week instead of 40, it reduces your hourly wage from $24.04 to $17.48, or $36K a year. 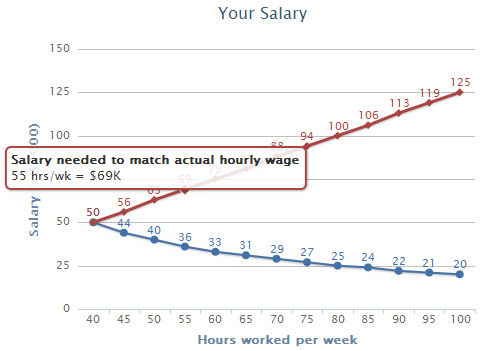 From another perspective, if you make $50K working 40 hours a week and you’re considering a new job that requires 55 hours a week, you’d need to make $69K to earn the same per hour. Think about this next time you’re putting in extra time at the office. Here are two sobering charts generated by the calculator. Cool graphs. :) It is amazing to see the hourly wage change so much.